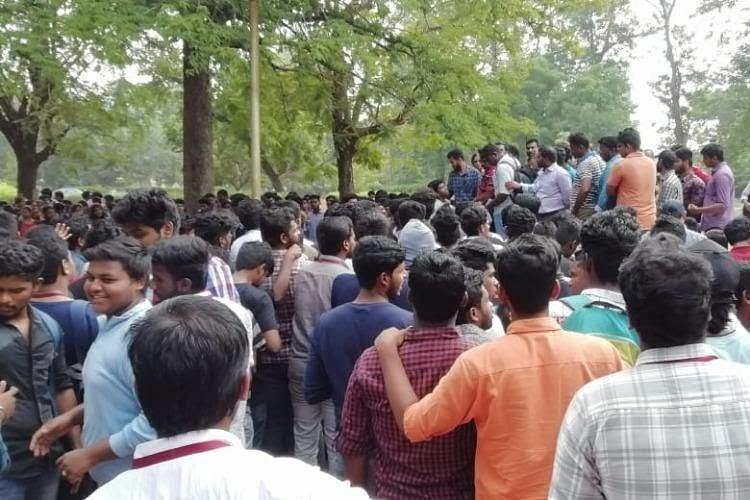 After the unfortunate demise of a first-year student on the sports field, the Madras Christian College has seen how tumult can turn to turmoil even when you don't have an abrasive union. However, the ongoing back-and-forth about whether the now controversial Sports For All programme — during which the Chemistry student collapsed and subsequently died — was dented substantially after a letter was sent from the College Union Society (CUS) to the Principal demanding changes. And answers. 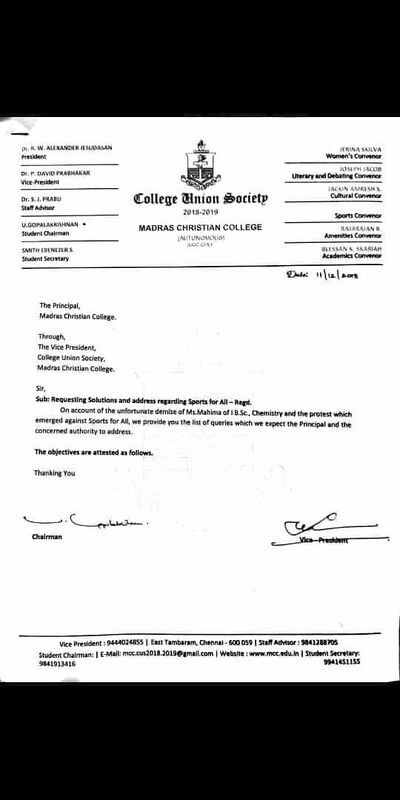 The letter, co-signed by Student Chairman U Gopalakrishnan and Vice President Dr P David Prabhakar, is directed to the Principal and represents in a premoninantly dignified way what their protesting kin were saying unsavourily — roll the Sports for All programme back to an elective. The letter read, "The primary and foremost request from the student body is to ensure that the Sports for All programme is reverted to an elective/choice-based programme, rather than a mandatory programme." As much as the Principal and college authorities have hinted, hemmed and hawed about the alleged general mandatoriness (and enforcement) of this initiative, the letter from the CUS is compelling evidence to the contrary. The letter was sent the day before Mahima J's funeral was held in Tambaram, with a huge trail of students taking part. Generally not known to criticise the working of the management, the letter comes as a shot in the arm for students, as it called for "scientific rationale" in applying this programme to students. The letter also states in no uncertain terms that in light of what happened to Mahima, no further sporting activities should be undertaken without the presence of medical professionals, "Medical practitioners, both male and female, along with proper medical facilities are to be on the spot/venue at all times during the programme. Ambulance services and doctors must be available in the college 24 hours," it read. Though Mahima was believed to be a generally healthy and athletic sort of person, other students have accused the Physical Education department of dismissing students' claims of medical issues or being on their period, as bunkum. 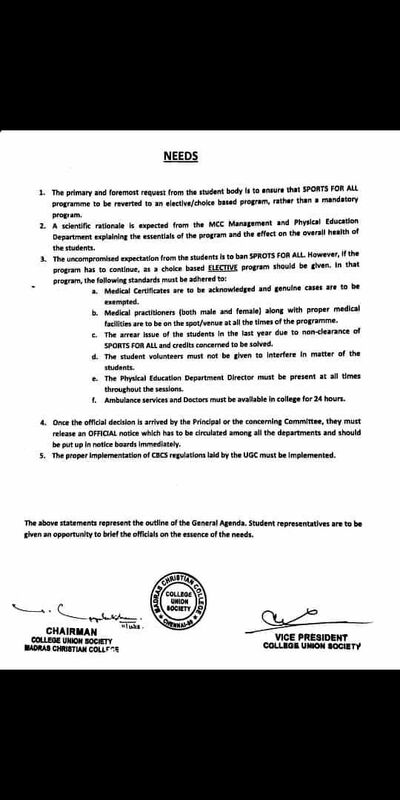 After calling students to discuss these claims, the CUS has put it down on paper, "Medical certificates are to be acknowledged and genuine cases are to be exempted," read the letter. While this is still a fairly sanitary version of some of the hoarser calls during the protest on Tuesday, the fact that the CUS has asked the Principal to respond to these queries in writing or make a statement explaining this, has earned a fair bit of praise from alumni and students alike. A clearer picture will emerge after the meeting convenes on December 14 to discuss the programme and the fallout of Mahima's death. Until then, uneasy lies the crown that wields the sports whistle.